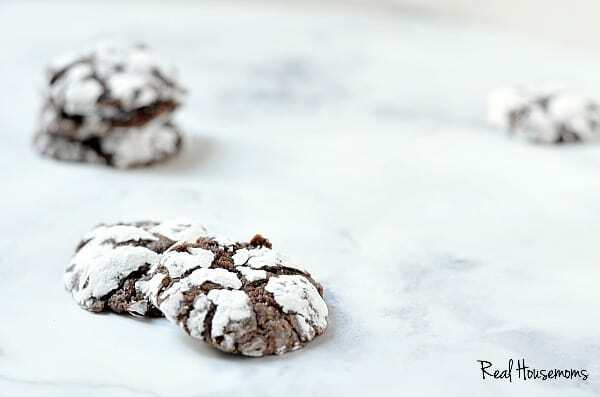 PEPPERMINT PATTY STUFFED CHOCOLATE CRINKLE COOKIES will be the hit of the cookie exchange! They are a new family favorite Christmas cookie! I had a friend come to town last weekend. We met when we both lived in Arizona. We worked together and then she lived with us for a few months when she was looking for a house. My kids got used to having here there and she became part of our family fast. We both moved away from Arizona last year and haven’t been able to get together until now. It was so great to see her again and show her our new home. The kids had a great time too. Once she got into town I let her know I was bringing her along to another friend’s cookie exchange. I love getting into the kitchen and cooking or baking with her. We have so much fun hanging out, snacking and drinking yummy stuff! We made Peppermint Patty Stuffed Chocolate Crinkle Cookies for the party and Cranberry Pistachio Oatmeal Cookies to take. They both turned out fantastic! 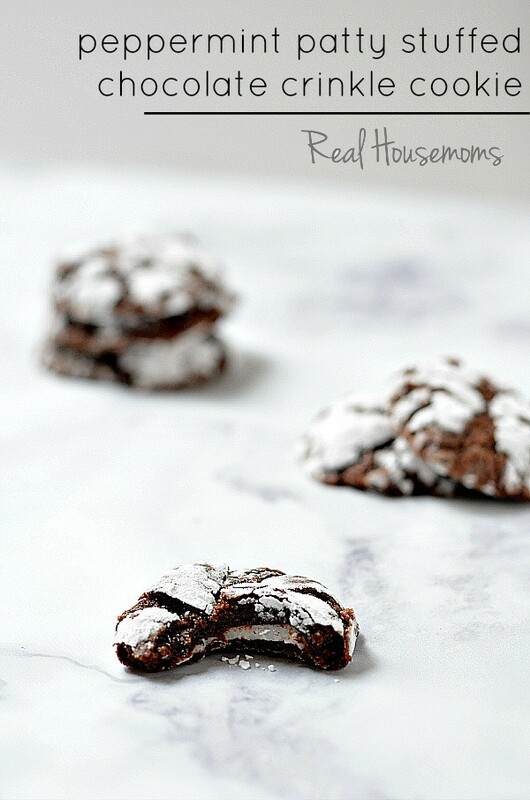 The chocolate crinkle cookies have a fudgy brownie taste with the peppermint patty right in the middle. My friend that hosted the cookie exchange texted me today and told me she liked both cookies but the crinkles were delish! I love getting texts almost a week later to tell me my cookies were tasty. 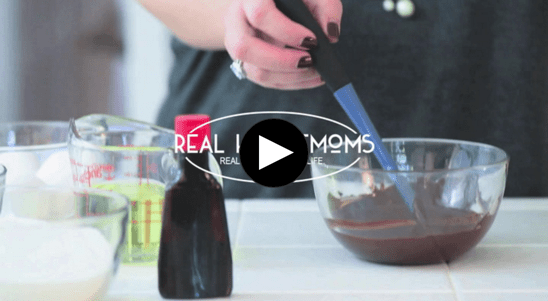 Make a batch of these cookies and some memories in the kitchen!!! 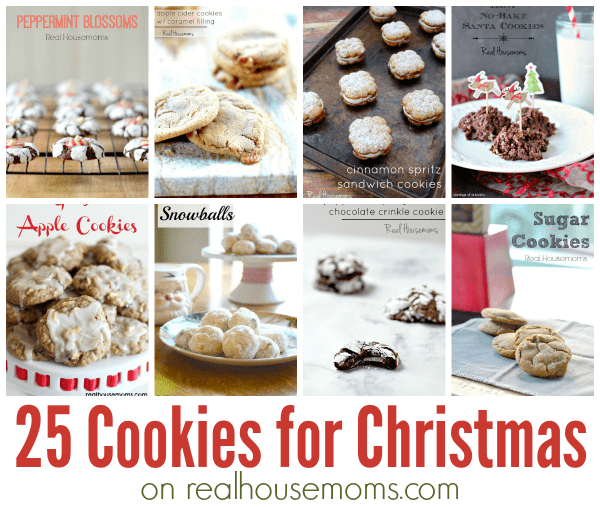 Don’t miss these other great cookie recipes! I wish that I had trusted my gut that the amount of batter in each ball seemed like a lot! I used a disher to get my scoops exactly the 2T size specified and ended up with HUGE cookies that were nowhere near done in ten minutes with a tiny little island of mint lost in the middle. And only twenty of them, not four dozen.